So yesterday was finally THE day I had been waiting for all the time. If you've followed the news on my index page, you know I was hot for this game ever since I started this website. It was not always like this. 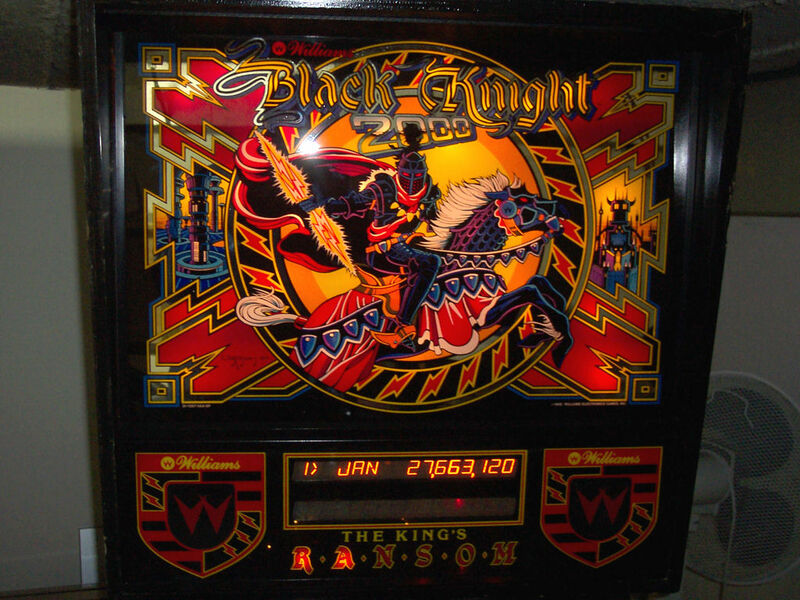 In fact I didn't know Black Knight (like so many other games) before I entered Peter's basement to test-play The Machine before buying it, and there I saw both Black Knight and BK2000, and I fell in love with the millennium machine after two games. So fast, so loud, so flashy, so unusual! 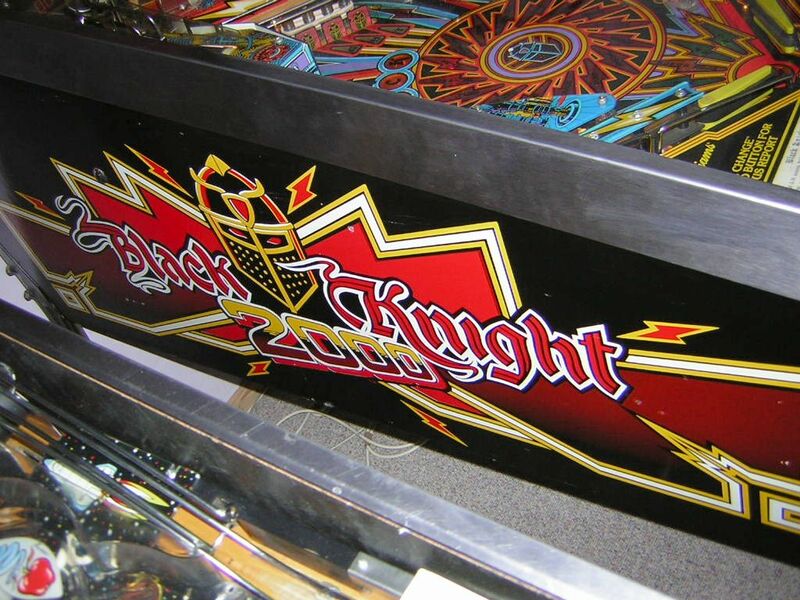 Whoever looks at Black Knight 2000 gets big eyes because this game features one of the really unique styles in pinball history. It's simply not comparable to any other game, but you have to see it in reality to notice that - photos and a virtual computer simulation cannot produce the same awe. I knew I would have a BK2000 one day, the question only was when. Now was the right time and the right chance, and I took this chance. So what can I say? It's paid very well. This article is longer and a lot more extensive than my others. 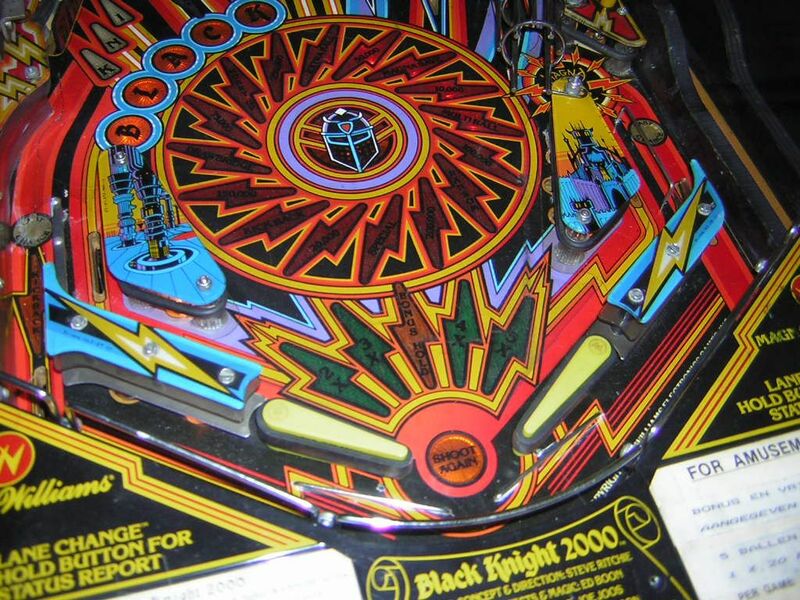 My top favourite pinball game is still The Machine since Black Knight 2000 is after all using a theme that does not 100% cater to my taste, as cool as it might be; it's 90% though, so it's close to The Machine's popularity with me. But while I really love her, I do love the beauty and style of BK2000, but only second to the Bride. Still, since this machine is rare and you don't find much info about it on the net, here is probably the biggest single article you'll ever read about it. So what happened yesterday? After the pricing and call problems with the shipping com-pany, they kept their word and the guy showed up at 13:30, just half an hour after I had come home early from work. The kind man carried the game with me into my room, and already that proved to be a challenge since the machine was packed very well with all kinds of plastic cushion film, glue tape and paper. 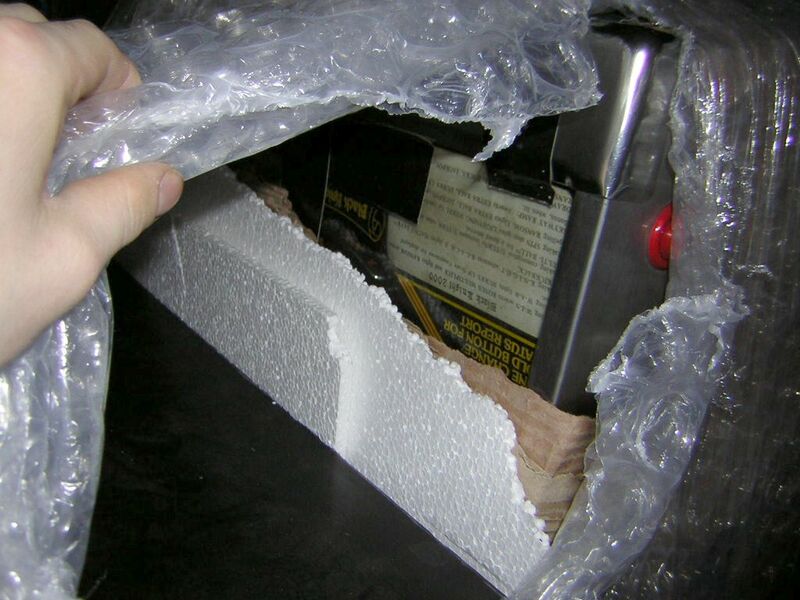 It was just hard to keep it in your hands under the heavy weight (standard weight about 100 kg) because the soft packaging always kept slipping out of hand. Once the machine stood upright in my room, I had to sign three papers and off he went. Now I faced the unpacking part, the most fun part of receiving a shipped machine, but also a tedious one with such tight packaging as this. However, I was glad at the same time because the transportation damage was zero. 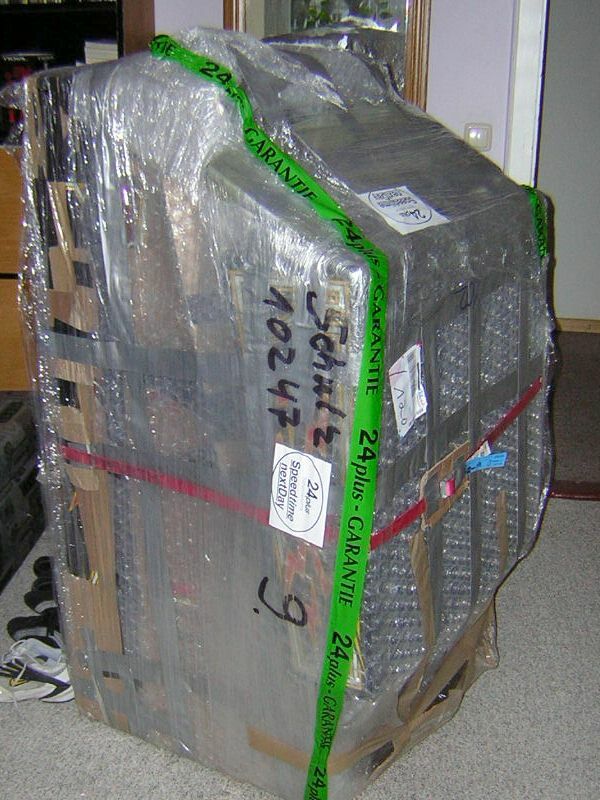 Now came the magical moment of taking the first peek at the cabinet, playfield and back-glass as I kept unpacking. There is no greater moment than this. You know what you are expecting, but you are still surprised every time by the size and the look of what you see when you "open the box". The first look at the playfield, the lower part with the flippers, was just terrific. 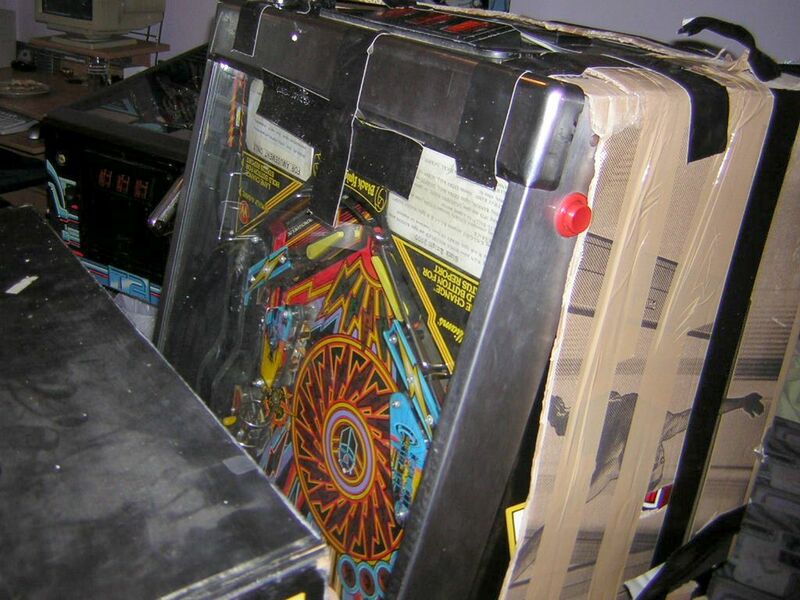 When I ripped the tape apart from the cabinet and playfield glass, I heard a small metal sound of a dropping object. I knew it was the key to the cabinet door! I had to look for half an hour in total while I kept unpacking and moving the machine. After I had moved it close to the location where I wanted to set it up, I put all the packaging material away and looked through all of it, finding the key inside. 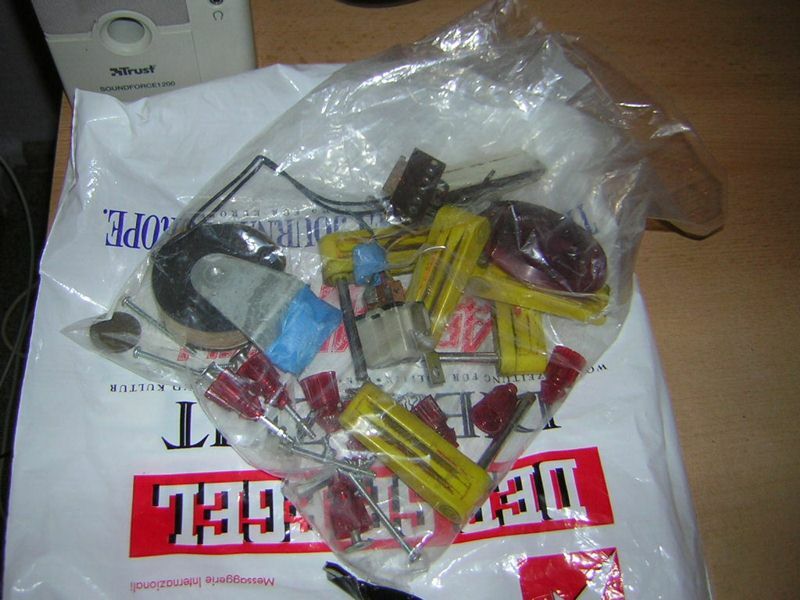 It allowed access to the cabinet and I could take a first top-down look into the machine where I found a plastic bag full of replacement parts which the seller had sent along plus a second ball plunger and the cashbox with the leg/backbox screws and the balls. 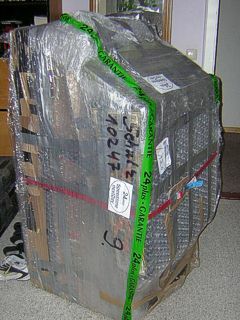 Now came the hardest part, attaching legs and moving the machine in place all alone without help. It was a premiere to do it all alone and took me about two and a half hours in total. 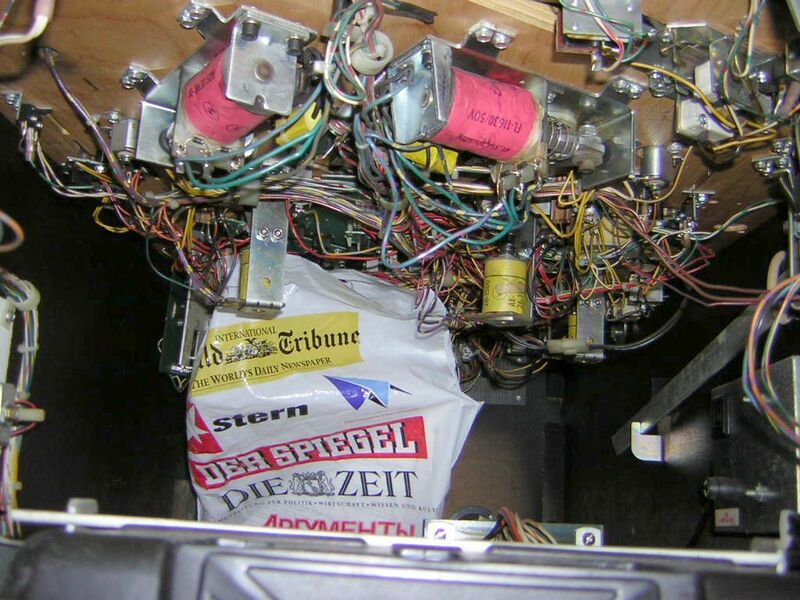 I also had trouble with the metal clip for the backbox at the rear end of the cabinet which was now on the bottom and is used to slide the machine along the floor. This didn't work really though since this clip was nasty and bit itself into my carpet all the time under the weight. If I had only detached it earlier... by the end I noticed this clip was useless anyway because it was too short; you couldn't close it after clipping it to the backbox! >_< Well, once I had the machine finally in the edge next to the Bride, I attached the front legs, pulled the rear end up while the machine was held on the legs, and holding the rear in one hand and on my knees, attached the rear legs to the cabinet. Then I crawled under the cabinet and lifted the rear end of the machine with my back and "pulled" or carried it towards the wall till it was in place. 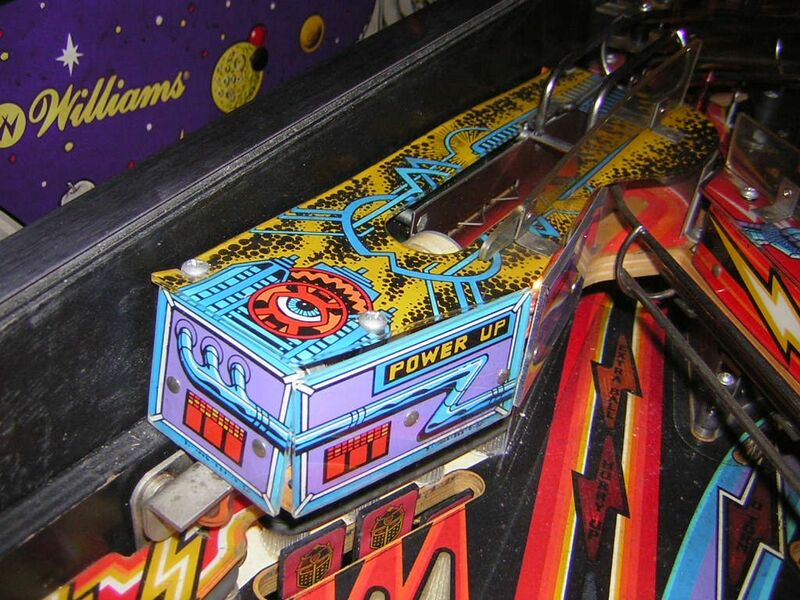 It wasn't the first time I used my back to lift a pinball machine since I learned this technique when I needed to change the height of leg leveling screws on a set-up machine. I wonder whether I will pay for this when I'm older? At least I've got a back-ache today, but it's more in the lower section because of all the pulling and pushing with my arms. It was a pleasure to see the backglass. It's a rarity in essence because backglasses already used translites in the late 80s, a plastic film with the artwork printed on that was put behind the transparent glass. While it looks good, it's not the same as a printed backglass like it was done till translites were invented. 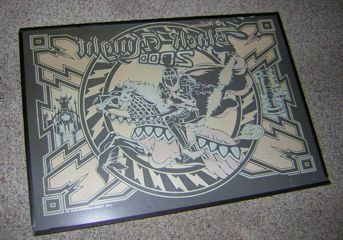 Black Knight 2000 makes an exception to this trend and features a printed backglass for one thing: there is a mirror effect along the silver lines on the artwork which is impossible to print on plastic or paper, so they layered it on the glass itself with the whole artwork old school style. Just cool! 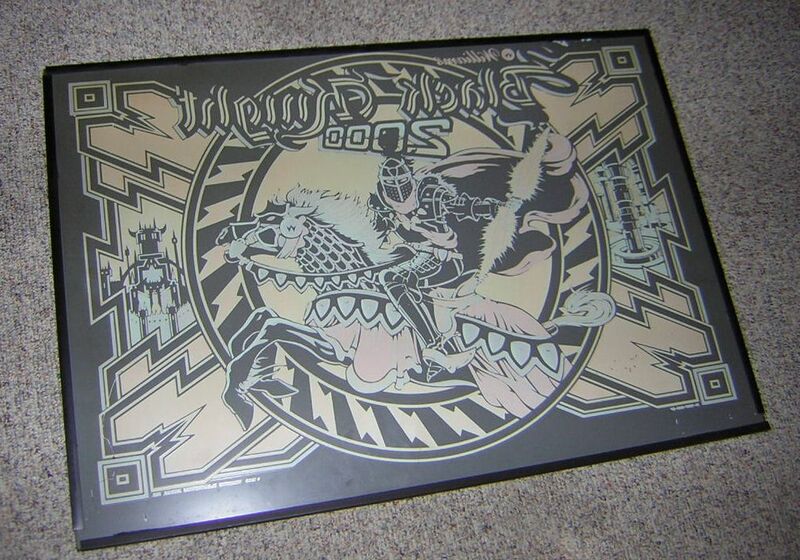 And the artwork is beautiful enough to make the backglass alone a collector's item. Two wear spots are visible on mine of which one is in the top area which is completely black, so this is hardly noticeable. The bottom right edge has two or three scratches though where the paint came off. It takes a close look to see it, but it's always a sign of age and it doesn't stop there. Where there's a rip in the paint, another can follow later. 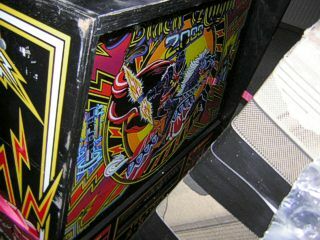 I guess I'll have to spray the paint sometime with the recommended paint protection from Marvin3m's Pinball Repair Guides. Putting the backglass back in after a short cleaning and check-out of all the connectors in the backbox, I was satisfied with what I found. The batteries were still usable, but I will change them by the end of the year (changing batteries once every year is recommended). 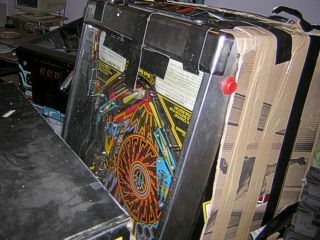 The playfield glass had only minor scratches, I had seen worse. After cleaning it and putting the balls into the machine, the moment of silence came. The machine booted up and instantly gave me a test report about one of the three switches inside the u-turn (the loop under the second playfield). It's probably just misaligned, but you can still play perfectly and get all loops counted. 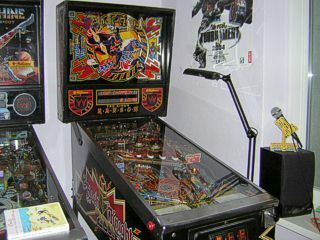 Then I saw the incredible highscores the previous owner had made on this machine: a whopping 27 million (!) was listed on place #1 whereas the default European setting is 7 million! So, I started a game to see what the machine was set up like. Since "game one ball one" is like no other game in your life on the same machine, I expected it to be quite short like most first games are, but then I noticed how well I could keep the ball in play (training on Visual Pinball?) and that it was set up as a five ball game, so the total play time was more than seven minutes. However, I did take some time to listen to the incredible audio while not moving the ball. Needless to say, the first game was unbelievable. The first ball dropped instantly after launching. 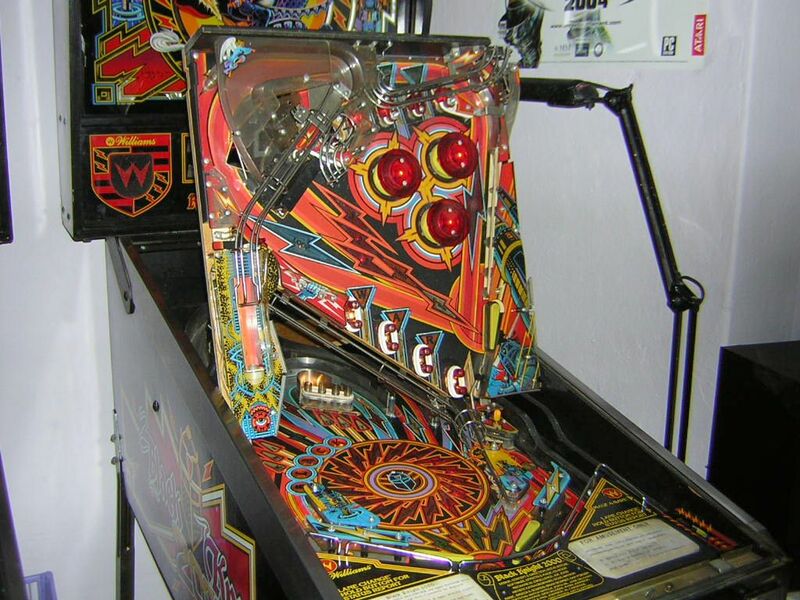 I kept the second ball on the upper playfield for a second by shooting a loop right after launching, and when I pressed the flipper button and saw the ball react, it was so different from the computer simulation. I had an instant feeling of control and power, I could start taking precise aim for all the shots that followed during the game. Shooting the drop target banks on the lower playfield resulted in the ball coming back quickly and gave the game a very classic feeling where shooting banks of targets was common practice. 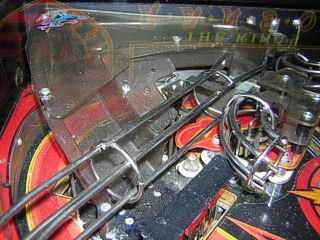 Every time the ball went back up to the second playfield, the challenge was on to keep the ball looping and opening the Drawbridge target bank which is harder than it looks. All in all I found the flow of the game very quickly. I was amazed just like I had imagined I would be. A perfect score! Even though the following games were all quite long and controlled, I never managed to get more than 4.5 million points. 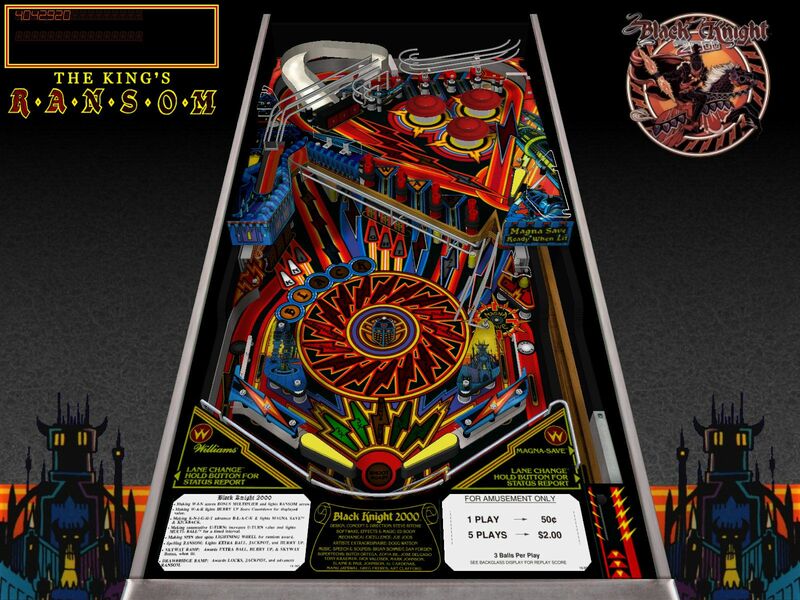 In Visual Pinball my highest score was 8.5 even though it plays much worse. I still need some real machine training before I can come over 7 million or do a two-digit million score. As I wrote in the "Machines I Want" section before, speed is the trademark of this game. Actually my game isn't fast enough for my taste yet, I need to drive the legs farther up on the rear end and polish the mylar which is still dirty. 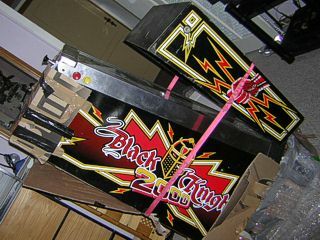 But speed makes the game so addictive and is captured in the theme as well: the lightning-bolt-shaped inserts and all the yellow-red-black stripes and circles on the playfield give the machine an aggressive touch, fitting to the audio and the character (the Black Knight). Actually I imagine the Black Knight as an American comic character, be it a hero or a villain. He looks and sounds like a fan favourite from those old comic days, a character you find cool even though you battle him in the game. 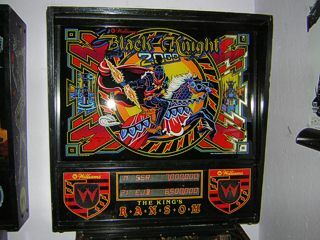 Originally coming from the 1981 hit game Black Knight, he has now changed to a futuristic cyborg-like version (the backglass shows it) and challenges you again for the ultimate battle. 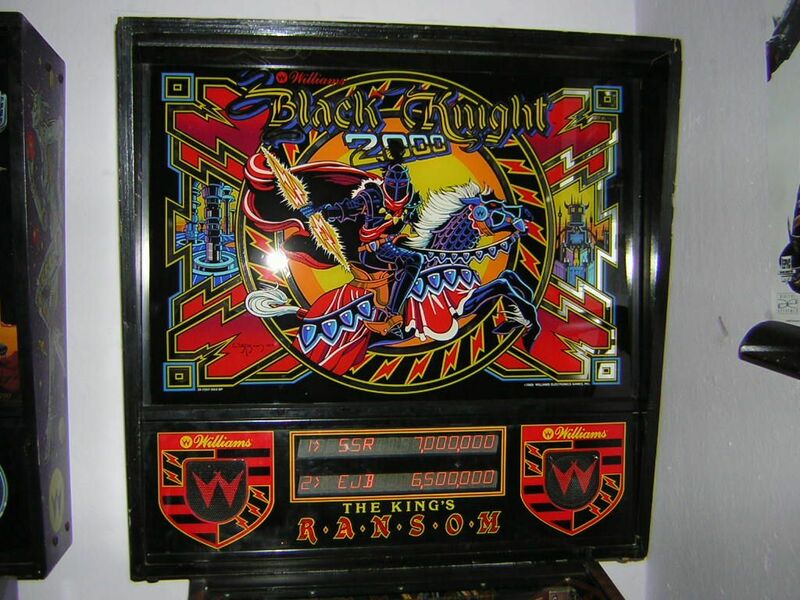 The plastics (especially the prototype ones I have) and the playfield artwork sink the knight theme into a future metal/industrial world and this is what gets me warm with the theme. I am not into knights at all, but the mix with the modern stuff in both visuals and audio tastes me very well. It is not the ultimate theme (I described this above) for me, but it's too cool to not like it. The sheer coolness of the theme, speech and music will make everyone watch in awe as the game plays in front of them. Plus, it has singing in it. "The Choir of Angels" as it's called by Williams mentally helps you beat the Black Knight with its cheerful female lyrics. 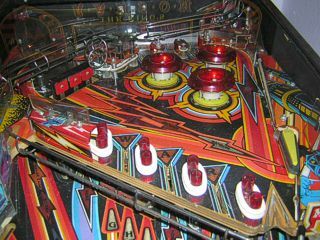 It sounds extremely kitschy, but since few other pinball machines have singing in their audio system, it's got to be hot. Speed. Changes between upper and lower playfield make the game fast as hell, and knocking down the two banks of drop targets on the lower playfield is really like it used to be back in the early days. The game does not go back to the classic roots beyond that, though. 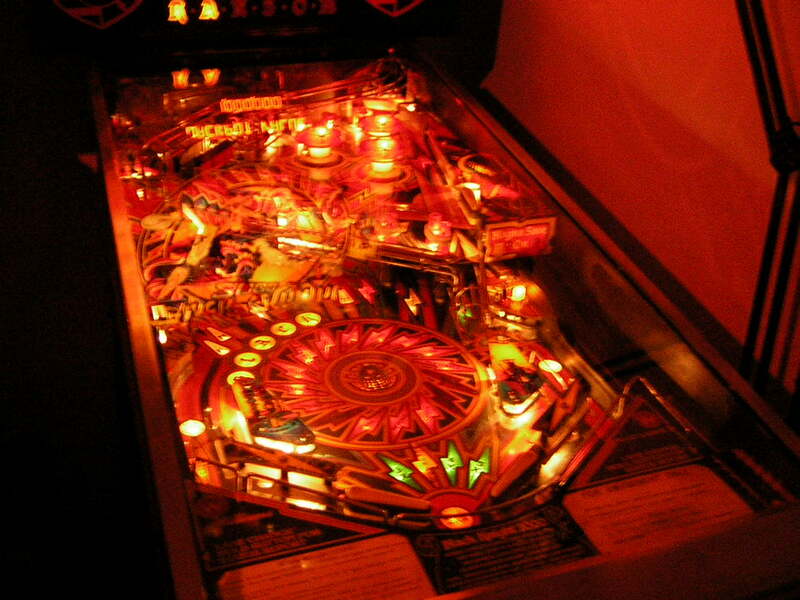 Instead it gives you a totally new and different feeling when the ball appears on the upper level. It's one thing to see it on photos and be amazed by the idea, but standing in front of the machine and seeing the ball up there is totally different. You notice that this is indeed much higher than the normal level and controlling the ball up there requires some good looks above your normal eye level you're used to from other games. You can either shoot repeated loops with the single flipper to rack up bigger and bigger points and also to light Extra Ball for a few seconds. 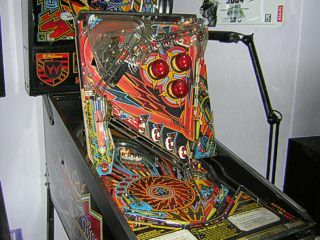 Getting the extra ball requires you to let the ball fall down to the lower flippers and shoot it right back up to the upper playfield. Or you can aim for the three red targets that open the Drawbridge for lock ramp access. Once three balls have been locked, 3-ball multiball starts. 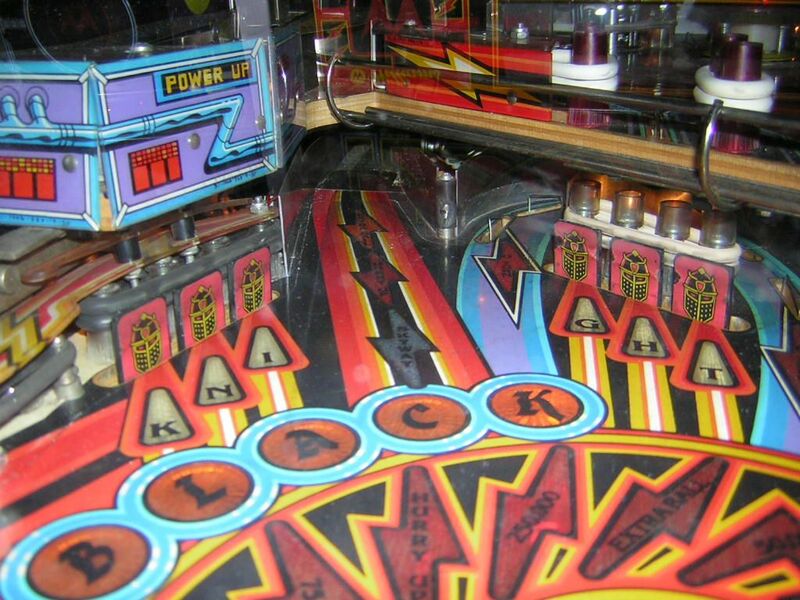 Incredible: all balls come down at once to the right flipper. Quick reaction is a must! 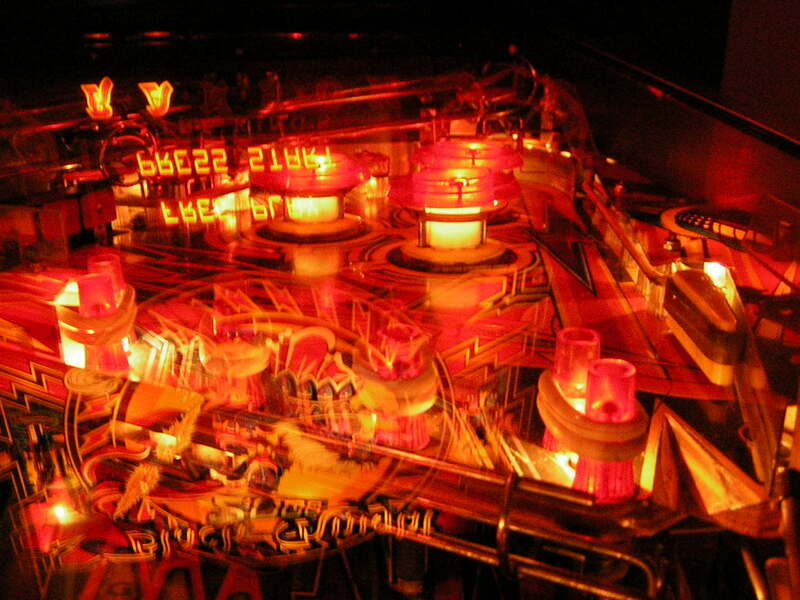 Alternatively, there are the bumpers which see some good action, the W-I-N lanes with lane change so you can bump up the bonus multiplier, and the W-A-R lanes which can be lit when the ball comes down. Those too can be changed and once W-A-R is completed, Hurry Up is started which gives you a very limited time while the award score ticks down and waits for you to shoot the ball back up to the upper level. The Hurry Up score increases every time you make it, and I've had Hurry Ups of 1 million! 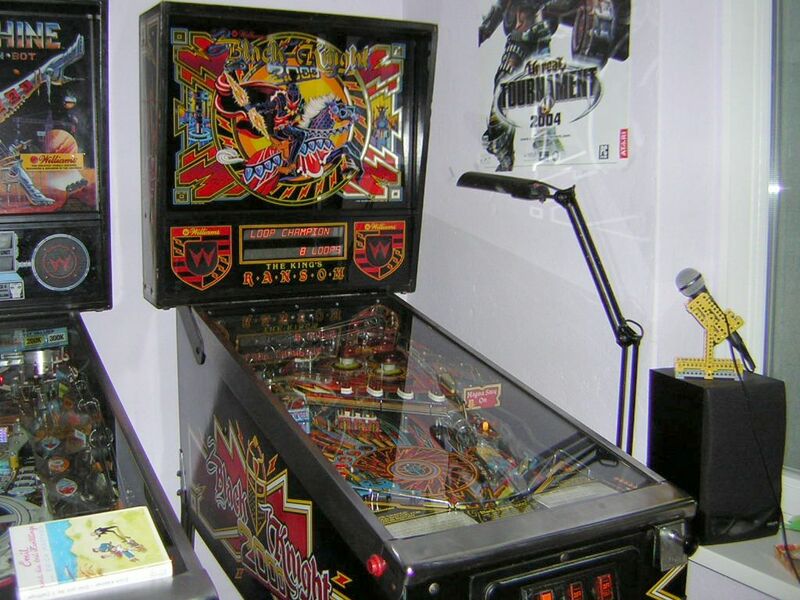 Another great thing is the 2-ball multiball which can be started from the lower playfield and where making W-A-R awards one million - unlimited times. In 3-ball multiball, you simply play for the jackpot which has a value that increases from game to game. In this quicker 2-ball mode, you can rack up the millions much faster if you are really good at concentrating on both balls and on both levels all the time. Then there is the Lightning Wheel which offers 16 prizes of which one is randomly selected when it spins. The u-turn is a loop under the upper playfield which can be shot from any direction and increases value if you're fast enough. And there's Magna-Save™, a Williams trademark that was already featured on the original Black Knight. If the ball drains through the right outlane, simply press the yellow flipper button behind the normal one and a huge magnet under the playfield will energize and capture the ball above the outlane, hold it and drop it into the inlane. Great way of manually saving your ball! Of course, Magna-Save needs to be reactivated with the drop targets. The left outlane has a kickback. The greatest best mode though is The King's Ransom. You have the word RANSOM on the display panel and each time the Ransom insert is lit and you hit the lock ramp, one letter is lit. It can also happen that the Lightning Wheel advances RANSOM for you. Once you have RANSOM complete, the game stops and builds up an enormous sequence of preparing the awards for you. Practically everything is lit: Extra Ball, u-turn at 250,000, Jackpot, W-A-R at 1 million, 5x bonus and bonus held, Skyway, everything. Now you've got a matter of seconds to collect as many of these prices as you can grab! If you've already locked balls, you have a 2-ball or 3-ball multiball in Ransom which means losing a ball is not the end yet; however, if you didn't lock balls yet, the machine will feed a second ball to the shooter so you can go on even if you lose the current ball. The end is definitely reached when the time is up and the game goes back into normal mode. Wow, what a ride! Well, if this game has a benifit except for the prototype plastics, it's the mylar which sticks to the playfield like I stick to my Machine. Only little bubbles are visible here and there and scratches are nothing to talk about. Cleaning the game and polishing the mylar should make it shiny and even faster. 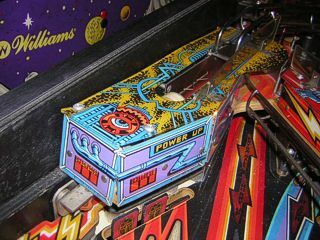 The switch in the u-turn needs adjustment and the ball popper on the upper playfield which kicks the ball out towards the flipper is somehow blocked inside the metal rail, so the ball often drops back. This needs adjustment or repair. I already replaced the ball plunger which had no power at all and I agreed with Michael, the guy whose Machine I repaired, to exchange his extremely strong Machine plunger with the second plunger I got for BK2000. This one is only mildly stronger than the currently installed BK2000 plunger, but it's strong enough for The Machine and the plunger in Michael's game is far too powerful for it since aiming for the skill shot is virtually impossible. BK2000 has no skill shot but a long distance to overcome till the ball is on the upper playfield, so I needed this power there. Restoration is not necessary. This game plays and looks as good as it can be. Best thing: there are no broken plastics. Especially the slingshot plastics often have broken-off edges on other BKs, so mine is a really lucky strike. I'm thinking about a ROM upgrade though since the installed ROM is a) English only and b) version PU-1, whereas the latest version is L-4 (I don't even know why mine's called PU). It's not that important to me to have a ROM with German language support, but it would be cool since I normally let my games run in German unless the translation is really horrible or unfitting, like Terminator 2 which I set up in English after the first game. BK2000's German translation is okay I think from what I saw in Peter's basement. However, I am not keen on getting a German-only ROM and the problem with System 11B games seems to be that they have no support for multiple languages like earlier and later (WPC) games, but only one fixed language, either English or German. If there was a ROM with switachable languages like all other systems have it, I'd want to take that, but if German is limited to German only, I'll stay on the safe side and stick with the original English ROM, but the version should be upgraded to L-4 anyway. I need somebody to burn me an EPROM chip first, though. 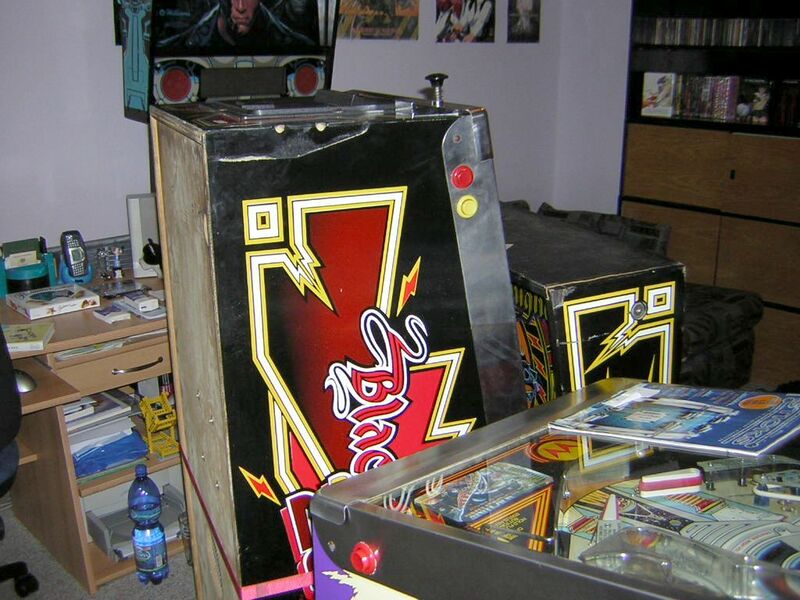 Maybe the Pinball Network forum can help me once again. I link to a direct download location on VPForums.com in the media section of every game where I know that a good or acceptable Visual Pinball conversion exists. This is also why F-14 Tomcat and Arena have no such links; their conversions are lame. Black Knight 2000 has such a good conversion that I want to describe it here shortly. I have added a high resolution shot to the left which was taken at 1600x1200 to make all the details visible. 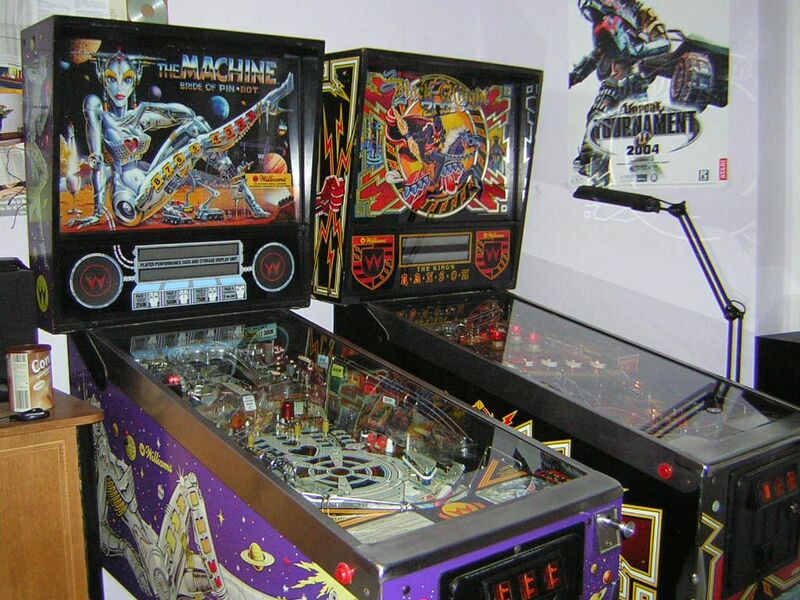 This conversion was made by a Pinball Network forum member (Lio) and has probably one of the best playfields you can ask for in the Visual Pinball scene. When playfields are scanned or photographed for conversion, they often end up looking very weird or just not very accurate - I have tried it myself with the new playfield of The Machine and it didn't turn out very well. 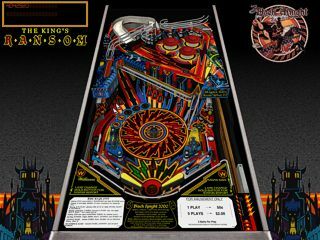 I can imagine that BK2000's playfield was completely redrawn or at least vectorized before Lio added the texture to his conversion. Also, the plastics (non-prototype) have been con-verted very nicely and you get a good overall impression of what the real thing looks like. The problem with VP is still that it doesnt calculate real-time or even static GI lighting, so the red and orange glow you see in a dark room from a real BK2000 is nonexistent here, and this greatly takes away some atmosphere. Still, if there's no chance to play a real game, you are best off with Lio's VP conversion. You can find detailed instructions on how to install and operate VP games in the "Visual Pinball" section. Just a few words about this game: Although the graphics and playfield assembly are very accurate, the gameplay is much slower than in reality, and the flippers have less power. You can easily tune this by changing a few values in the editor and restarting the game to see the effect. Also, I'm of the opinion that BK2000 looks a lot better with black flipper rubbers, so I changed the original red rubbers to black on this shot. My BK2000 had black rubbers when it came to me, so there was no change needed there. Last words go to the ROM file: ROMs can be found in the IPDB, but the English L-4 ROM is corrupted and has some errors in the testing routine, plus you will see an error message every time you start the game. I have been told that the ROM on Williams' official site www.wms.com is stable, so try to get the ROM from there. Black Knight 2000 is an awesome game. I don't think that I will ever sell it or exchange it. It's too good and too rare and should it really become boring someday, I'll rather pack it in and store it somewhere else instead of giving it away. I've heard people say "I sold my BK2000 and now I regret it" and I don't want to make the same mistake. There is just no need to sell the game anytime! It's so much fun and was so worth the money and I still face the challenge of placing my name in the highscores which I haven't managed yet. It's a tough game, one for the experienced player to master and for the new people to practice accurate shooting and speed control for a long time. Being in such a good technical condition and requiring only routine work to make the optics and playfield quality close to perfect - all this makes for the best deal I could ask for. Add the fact that I got the complete set of prototype plastics in this game which I like a lot more than the later plastics because they are a lot more techno-like and have less of the medievil knight theme, unlike the later ones that feature a blue castle in gothic style and stuff like that. The plastics I have are more colourful, have indescribable artwork and add a mystery and industrial percentage to the theme. And since they are rare, they make the game worth even more, no matter whether I sell it or keep it for the personal value it has to me! Final words: play Black Knight 2000. 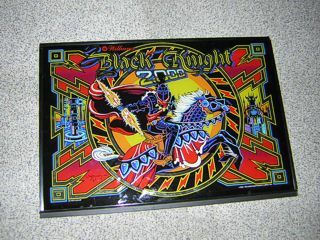 You cannot go wrong on your first try and all the naysayers who are fans of the original Black Knight should play a few BK2000 games before swearing. True, some fans did play BK2000 and disliked it, but every game has people who dislike it. I cannot expect everybody to love The Machine like I do. In fact I don't think anyone else does because I have that special childhood memory of her and I'm younger anyway than all the other collectors in the world (anyone my age or under 20 reading this? 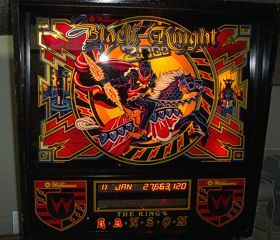 ;-) I love Black Knight 2000. If you've never seen it before and you get the chance one day, mark my words - don't miss it. Stephanie Rogers, the voice of The Machine, sent me exclusive information that was previously unknown to many: she sang the Choir of Angels together with a friend, and she also provides the accurate lyrics here! The angel voices were fun. I had forgotten all about the "ahhh..." part. The male speaking voice is Rich, who was an audio engineer there. How funny. Now I'm quite sure it should be "you got the power" and "get ready to battle", but I'll leave that up to Stephanie to judge. Thanks for the info! Despite what I wrote in that last paragraph, Black Knight 2000 was sold in July, the reason being that even the best System 11 game is just that - a System 11 game and my taste for them changed quite a bit. Diner, the second-best System 11 game I had, left with BK2000, and in exchange for that I got Stargate, a DMD game. If you look at the latest news entries and the Stargate article, you can find a kind of explanation. 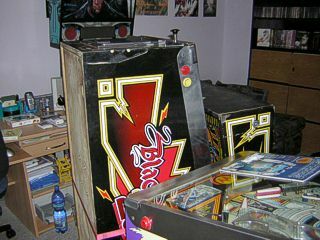 Still, the fact remains that BK2000 is an incredible game unlike many others and whoever hasn't tried it is missing out! I plan to get it back someday when I have more space and money, and when not every pinball machine I have needs to be first class. Tons of photos are here! 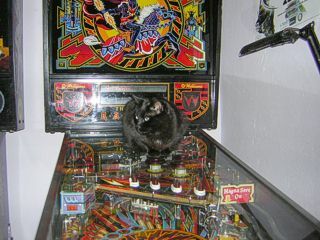 Check the Internet Pinball Database for additional info. You can read about the revolutionary tech used in BK2000 on the second flyer scans! Here is an audio mix I made from the IPDB audio samples. The copyright of these samples is with the IPDB and the provider is unknown. This mix is practically just a timed collage of all important music pieces the game has to offer. Events like normal play, multiball, jackpot and Ransom are included. And if you want to try Black Knight 2000 on your computer in Visual Pinball, get the table from VPForums (registration required) and read the paragraph that I wrote farther above.